How did he take such profoundly empathetic photographs? my motorcycle broke down and, looking for something to do, I hitchhiked to Cairo, Illinois, where civil rights demonstrations had begun. It took about one demonstrating speech by John Lewis, the Student Nonviolent Coordinating Committee’s twenty-two-year old chairman, to win me over to “the movement”… Taking shots at SNCC workers and brutally intimidating people attempting to vote was commonplace at the time, and it was impossible for me not to admire the courage of the people I was meeting in the south. Lyon sounds like a naive idealist discovering politics—“it took one speech”—not a historically aware thinker. But following his simple, even simplistic, intuitions to their profound conclusion, he dropped out and committed himself to SNCC. Soon he was documenting protests. Impressed by the prints, John Lewis made him the organization’s official photographer. Sometimes idealism can be a good thing. Today what’s most striking about Lyon’s photographs is how calm they are. His autobiography may suggest a man keen to provoke and denounce, but, with the exception of two shots of police manhandling protesters (and a famous profile of a helmeted cop that was published with the prescient caption, “Is he protecting you?”), he did not depict confrontation at all. Neither did he go looking for suffering. His focus, rather, was the SNCC’s day-to-day functioning: children picketing a whites-only swimming pool; voting-rights demonstrators outside the state legislature; a Selma choir in performance; a lunch-counter sit-in. From SNCC’s perspective, Lyon’s photographs made for excellent propaganda. But as an artist, he accomplished something more. By following SNCC’s operations with single-minded devotion, Lyon created an aesthetic of dignity, not of anger. The March on Washington, Aug 28, 1963, for example, is a frontal close-up of two protesters. It’s shot from a low angle—Lyon seems to be bending or kneeling—and one marcher’s arm rises into the sky with the dramatic economy of a woodcut. More strikingly, both marchers have their eyes closed. Calm and struggle coexist in the image. One seems a result of the other. Lyon joined SNCC on a whim. So how did he take such profoundly empathetic photographs of its members? What makes these photographs so tragic and extraordinary is that, looking at them, one is convinced that they were not taken to please generals, to boost the morale of a civilian public, to glorify heroic soldiers or to shock the world press: they were images addressed to those suffering what they depict. Lyon’s photographs possess the same convincing intimacy. He does not, and perhaps cannot, make grand symbolic denunciations in the manner of Sebastiao Salgado. But he invented his own form of political witness by sympathetically attending to an individual’s presence. Over the course of his five-decade long career, Lyon went on to document some of America’s most marginalized communities—prisoners, prostitutes, illegal immigrants, Native Americans—in this resolutely private manner. These photos, along with his itinerant film and montage work, are now on display (through September 25) at the Whitney Museum as part of an absorbing retrospective titled Message To The Future. Lyon would often embed himself in a social group for months, slowly building friendships with perspective subjects. This submersion gives his photobooks a collaborative feel. Sometimes they even feature contributions by people he photographs. (The Bikeriders  includes an oral history. Conversations With The Dead  is spliced with drawings and letters by a prisoner named Harry Clune.) In general, there is a sense that Lyon’s subjects are expressing something of themselves. This is especially true about The Bikeriders. After two years with SNCC, Lyon returned to Illinois to photograph biker gangs in the Chicago area. He had been part of one himself—there’s a self-portrait of him straddling a motorcycle in the exhibition—and clearly admired their lifestyle. (In the book’s introduction, he declared his unabashed intention to “glorify the life of the American bikerider.”) But instead of calling attention to the glamorous dangers of biker gangs, he created something like a family album for them, a fact that is evident in his formal decisions. By and large, Lyon’s bikers cheerily pose. Sometimes they stand beside their bikes; sometimes they are riding. But almost all the compositions are neat enough to feel comfortably staged. What is impossible to stage, however, is the easy camaraderie of the bikers’ carefree expressions. Sparky and Cowboy flash semi-serious smiles that verge on laughter. Corky, who has parked on Indiana Toll Road, is rather pleased with himself. The general atmosphere is that of a holiday. We are biking now; the world can wait. This, of course, is not a complete portrait. Lyon’s bikers drink but are never drunk. They date, but don’t fight with their girlfriends. They speed, but no accidents—alluded to in the book’s accompanying text—are even shown. (Nan Goldin can be cited by way of contrast. She depicted the joys and dooms of the fringe milieu of her friends.) But Lyon never intended to make an objective portrait of the biking community. His subject was their spirit of freedom, a spirit he allowed them to portray. In either case, his next project was “unflinching” enough to satisfy any realist. 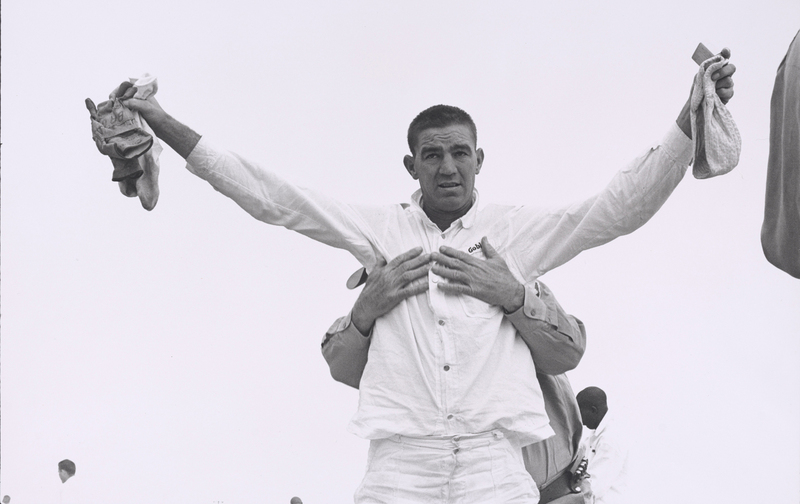 In 1967, Lyon won permission from the Texas Department of Corrections to live at one of its prisons and photograph inmates for a year. Conversations With the Dead (1971), the book that emerged from this period, is in some ways a continuation of Bikeriders. Only now circumstances are flipped. The bikers represented freedom; the prisoners, confinement. The bikers had hope; in prison, hopes disappear. Though he meticulously detailed the degradations of prison life—strip searches, forced labor under the sun, the continuous presence of armed guards, claustrophobia—Lyon’s real focus was the internal life of prisoners. Weight Lifters, Ramsey Unit, for example, shows two prisoners in a tiled space barely as large as a bathroom. In the foreground, a bare-chested man in profile is reading a letter. In the back, another is lifting a rudimentary barbell. Both men—they face opposite directions in a neat symmetry— are engrossed in their activity, which makes the scene twice as poignant: it suggests how prisoners cam emotionally escape, but also makes visible their inescapable physical proximity. Cell-Block Table likewise shows two domino players. Atypically, Lyon shot it from an aerial perspective. But the prisoner’s anonymity serves to make their situation more touching. We see them not as criminals but as boys playing games; the system that imprisons them is made to seem somehow flawed. The most remarkable images in Conversations are portraits. It’s not simply that the prisoners feel comfortable around Lyon, but that they look back at him. Given the disparity of their situations, this has an extraordinary effect. Charlie Lowe, Ellis Unit is a portrait shot across prison bars that diagonally cross the frame. Lowe looks at us with raw, almost animal longing. The message is all to clear. This is perhaps overstating the case. Lyon continued to work in the still medium. But a growing interest in expression and time turned him toward making experimental documentaries. These films were about his friends and the people he met. As such, they possess the same intimate aura of his photography. But there was a crucial difference. In a single frame, the complicity between photographer and subject seems absolute. In the films, it is shown to waver, which creates a drama of solitude. Three of Lyon’s films are screened on loop at the Whitney exhibition: Bill Sanders is a short, judgment-free portrait of a hard-drinking tattoo artist from Houston; Dear Mark, an experimental homage to his friend the sculptor Mark Di Suvero; and Willie is Lyon’s only feature-length film. Llanito, which does not appear in the Whitney’s exhibit*, is a social portrait of Lyon’s new home, featuring Chicanos, Native Americans, and inmates at a local mental institution. Llanito is the longest and most immersive of the three. It also points towards a theme that would grow increasingly significant to Lyon: American imperialism. The meaning of that word, Imperialism. As a citizen of the United States I must dedicate my work to her enemies, the guerilla fighters and student liberators of America…. And most of all I would like to dedicate my work to the liberation of my fellow countrymen, by delivering them the truth. The words are grand. But the photographs remained intimate and calm. *Correction: An earlier version of this review misstated the films on view at The Whitney.